Taiwan has always been proud of its religious freedoms. From the early animist beliefs of the aboriginal peoples to the Christianity of European missionaries and the Buddhism and Taoism of mainland Chinese migrants, the island nation has long been a melting pot of different faiths. Today, those freedoms are evident in the quaint churches and spectacular temples that are literally scattered throughout the country. I must confess that Western religion has always struck me as somewhat solemn and insular. Church and synagogue services are highly structured, and our houses of worship somehow seem to reinforce this idea with imposing buildings that too often make it difficult to connect with the outside world. Conversely, Taiwan’s temples immediately struck me as open and breezy with their big, inviting courtyards. Instead of doors that close and lock, temples often use a series of archways, offering a permanent invitation to wander in. The temple feels part of the natural world, as though it was built not to separate people from the environment but to incorporate the environment into people’s spiritual experience. This makes sense, given that many Buddhist and Taoist ideals centre around the goal of living lightly on the Earth. Temples encourage a spiritual connection to nature by creating a physical connection to nature. 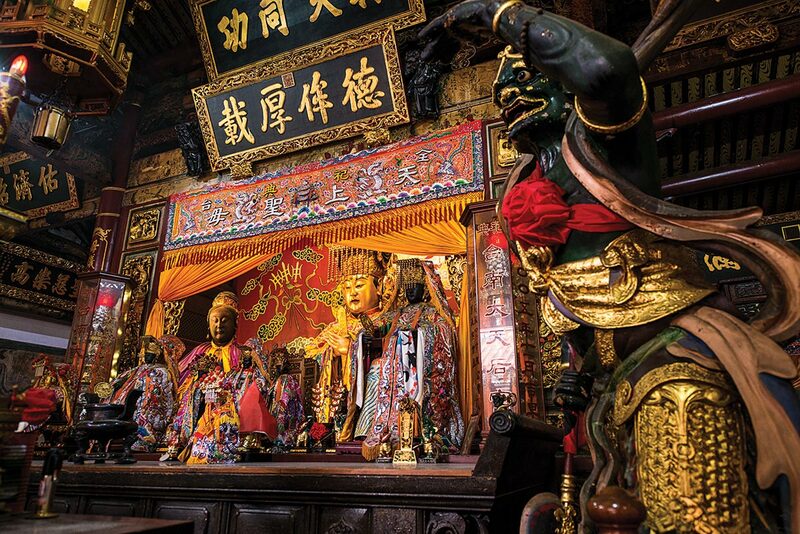 The rich gold and black interior of one of Taiwan’s many temples. Though there is definitely proper temple etiquette—to maintain good feng shui you always enter a temple through its right side and exit through its left, for example—there seems to be a lot of space in a temple for people who just want to wander, reflect and do their own thing. When we visited the Longshan Temple there were plenty of visitors meandering through, taking photos, praying off in a corner alone, or communing on their own time. While the temple definitely helps to ground you, it also gives you a lovely sense of being free. 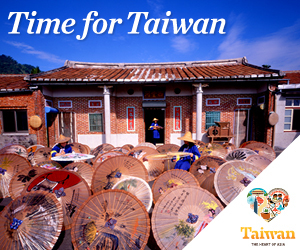 Taiwan’s temples feel like living, breathing places that people use—not just to commune with the gods, but to hang out and read under the trees, take kids on field trips, enjoy the natural space, the gardens and the light. As a result, religion and spirituality feel completely woven into the mundane moments of everyday life, rather than something you attend to for an hour on Sunday. There are several Confucian temples across Taiwan, but the Confucius Temple in the city of Tainan is the first of its kind, built in 1665 during the late Ming dynasty. Once a centre for Confucian studies, today it’s a true oasis in the middle of a bustling metropolis. When we visited, a middle-aged guy in a neon headband was leading a group of teenagers in a Tai Chi class in the courtyard of the temple, and it was lovely to watch this ancient art find new relevance among a group of giggling, high-fiving, iPhone-carrying adolescents. Elsewhere on the grounds, a teacher led her class of tiny Taiwanese kindergarteners through the gardens, telling them a story that had their complete rapt attention. Young couples chatted and dozed under mango, cedar and mulberry trees, as the faint sound of traffic droned on somewhere in the background.